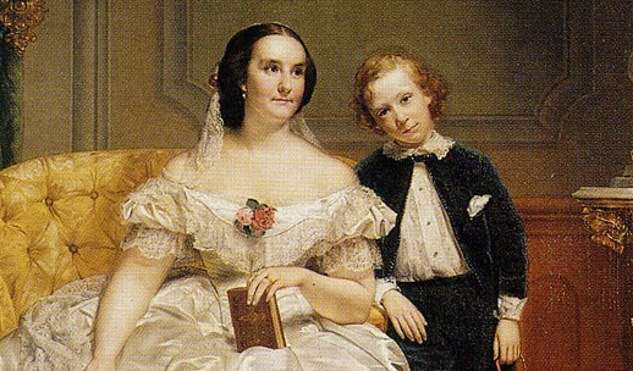 Elizabeth Jarvis Colt and her only surviving son Caldwell, by Charles Loring Elliot (detail). As the Civil War raged in 1862, 35-year-old Elizabeth Jarvis Colt suddenly lost her beloved husband and year-old daughter to illness. A son had already died in infancy. Six months after she was widowed, she gave birth to a stillborn daughter. And then her three-year-old daughter died. Elizabeth Jarvis Colt was left with one son and the firearms company that supplied the Union Army. She made the most of it, despite her grief. 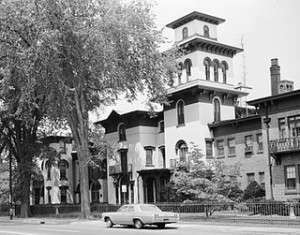 Were it not for the woman dubbed ‘The First Lady of Hartford,’ the Colt Manufacturing Co. would not exist, the Union Army would not have been supplied with firearms, the six-shooter would never have been made, the Wadsworth Athenaeum would be short of a wing and 600 art objects and Hartford would not have the Church of the Good Shepherd and Parish House. She was born Oct. 5, 1826 as Elizabeth Hart Jarvis in Saybrook, Conn., the daughter of Episcopalian minister William Jarvis and his Elizabeth Miller Hart Jarvis. Her mother’s ancestors included royal governors, and she grew up with affluence and social standing. She met arms manufacturer Samuel Colt, 12 years her senior, in 1851 in Newport, R.I. He was a world-famous figure, by then building a manufacturing complex in Hartford. He called it Coltsville when it was finished in 1855 and capped with an iconic blue onion dome. It was the largest private weapons maker in the world, turning out 150 guns a day. Sam Colt was also a charmer, and he swept 25-year-old Elizabeth Jarvis off her feet. She fascinated him with her beauty, her proud bearing and her strong will. They were married on June 5, 1856 in an elaborate wedding that featured a six-foot-high wedding cake decorated with fondant pistols and rifles. Theirs was a love match. They took a long honeymoon in Europe and on their return moved into the mansion he built for her as a wedding gift. The house overlooked Coltsville. It had Turkish domes and towers, wrought iron balconies, fine art, a huge greenhouse and deer and peacocks roaming the grounds. He called it Armsmear. The new couple was happy for a time, unaware of the tragedies they were about to face. “How could we dream of the fearful storm so soon to burst upon us?” Elizabeth later said. Their first child, Samuel Jarvis, was a bright, happy child who died at 10 months after a short, painful illness. They had three more children, Caldwell, Henrietta and Elizabeth. 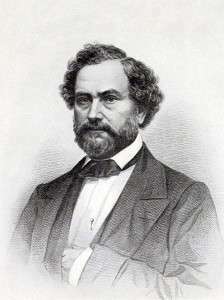 Seven years into their marriage, Samuel Colt died of suddenly of complications from gout on Jan 10, 1862. Henrietta died a few days later and Elizabeth the next year. Elizabeth had inherited a controlling interest in the Colt Manufacturing Co. Despite her grief, she kept the company going, making sure every Union order for guns was filled. In 1864, suspected Confederate sympathizers burned the Colt factory to the ground. She watched the flames from her window. She had, however, had the foresight to buy insurance for the plant. With the help of her brother Richard, who served as president, Elizabeth Jarvis Colt rebuilt the buildings and made them fireproof. They expanded the company, developing new firearms (including the six-shooter known as the ‘Peacemaker’) and employing as many as 1,600 people. Her only surviving son, Caldwell, designed the Colt double-barreled rifle. 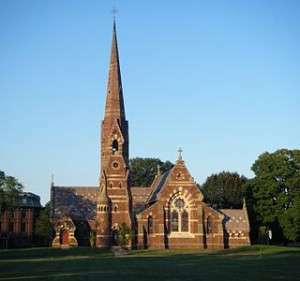 After the Civil War ended, Elizabeth commissioned Edward Tuckerman Potter to design the Church of the Good Shepherd in memory of her husband and four deceased children. Potter, who also designed the Mark Twain house, came up with a gorgeous building decorated with marble guns and gunsmith tools. It is now on the National Register of Historic Places, as is Armsmear and the Coltsville Historic District. While steering the Colt Manufacturing Co., Elizabeth Jarvis Colt also threw herself into social and civic causes. She served for 22 years as president of The Union for Home Work, a pioneering organization that provided daycare for the children of working mothers, meals and access to education. She became the first woman president of the Hartford Soldiers Aid Society, raising $1 million for veterans in just two weeks. 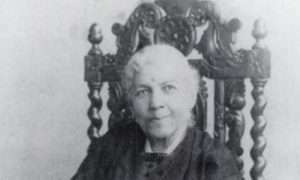 She organized the first women’s suffrage convention in Hartford in 1869, 51 years before women won the right to vote. She also founded the Hartford Decorative Arts Society, now the Hartford Art School at the University of Hartford. Church of the Good Shepherd, Hartford. In 1894, Caldwell Colt died at the age of 35 in a boating accident in Florida. Elizabeth, having lost her husband and all five of her children, commissioned the Parish House for the Church of the Good Shepherd to help allay her grief. She was 68. In 1901, she sold her interest in the Colt Manufacturing Co., but continued her philanthropy. Elizabeth Jarvis Colt died on Aug. 23, 1905, at the age of 78. Her obituary took up the entire front page of the Hartford Courant, which called her the First Lady of Connecticut. She left her art collection to the Wadsworth Athenaeum and the Armsmear grounds to the City of Hartford. Armsmear itself was to be used as a home for the female dependents of the Episcopal clergy.